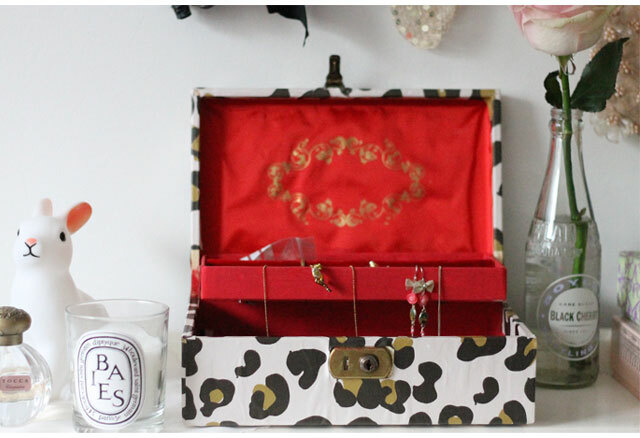 Today I'm sharing a made-over DIY jewellery box. 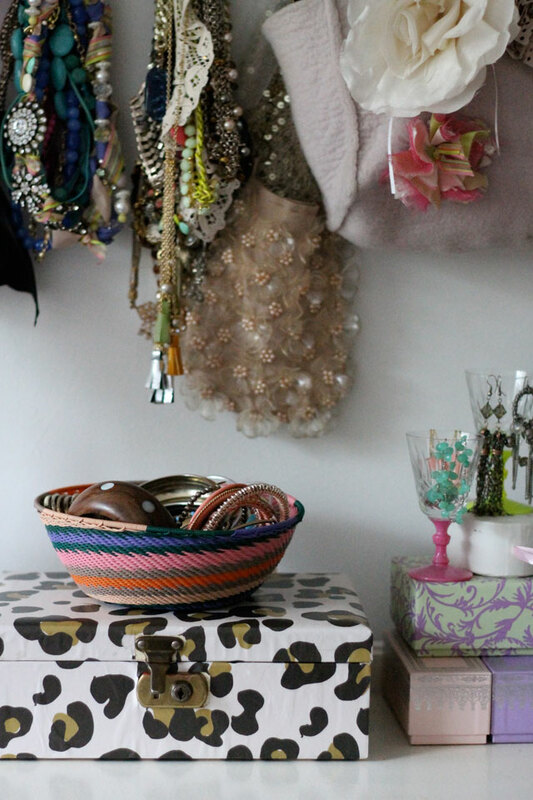 As part of my mission to condense my stuff before we move I have cleared out a large stash of jewellery and as such I have been only storing my favourite pieces in here. 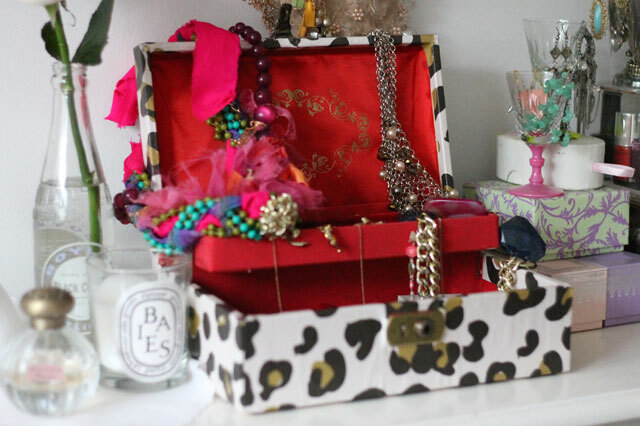 My love affair with jewellery boxes started when I was little and I was given one of those boxes with a musical ballerina, I thought it was magic (actually I still do), now my dream is to have a leather Smythson one ideally in yellow or duck-egg (I look at them longingly every-time I'm at the airport) but as they cost more than my entire jewellery collection i'll be enjoying this charity shop treasure for the time being. I found this in the charity shop for 50p, it was sad and smelly but the lock and red lining hooked me. Using Mod Podge and wrapping paper (make sure you use the thick fancy type), I like to think that I have transformed it into something a little bit special. I have put some loose steps below as I realise that you might not find exactly the same box but you can use the same principles to transform your own. Step 3. 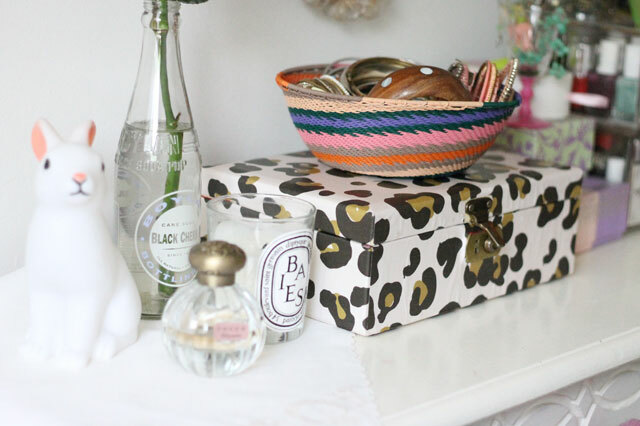 Draw around the top and bottom of the box and the add on extra for the width and some extra to tuck inside. Add tabs on the sides that will be tucked in. Step 4. Cut out your shape with a craft knife and fold along all the edges, this will make the paper to fit to the box. Step 5. 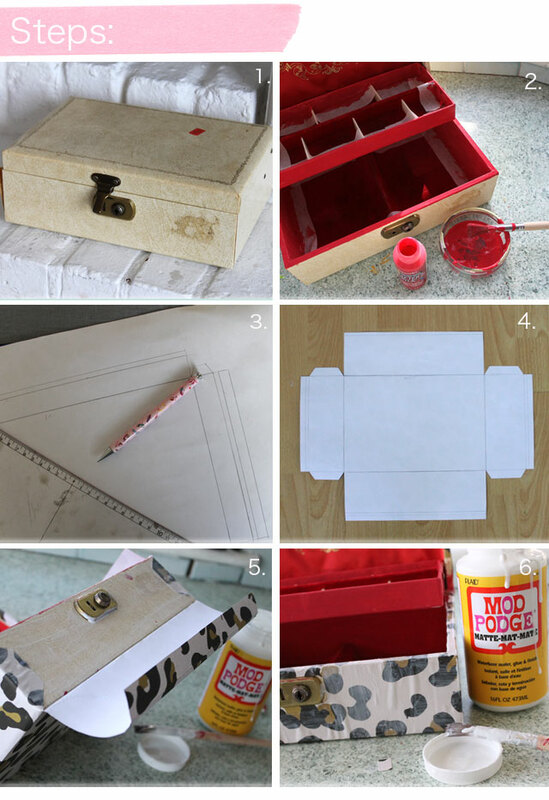 Apply a fine even layer of Mod Podge to your box and carefully apply your paper, smoothing out any air bubbles as you go. My first 'proper' ring was my great-grandmother's engagement ring - my grandparents gave it to me when I was 16. It's a little diamond with a ruby on either side, set into a gold band. Jewellery pieces created by jewellery designers are a lot more special than mass-produced pawn shop scottsdale pieces. That is because jewellery designers often release their creations on a limited basis, making them more unique.